Welcome to a brand new feature here at Miss Dream: Moonie of the Month! 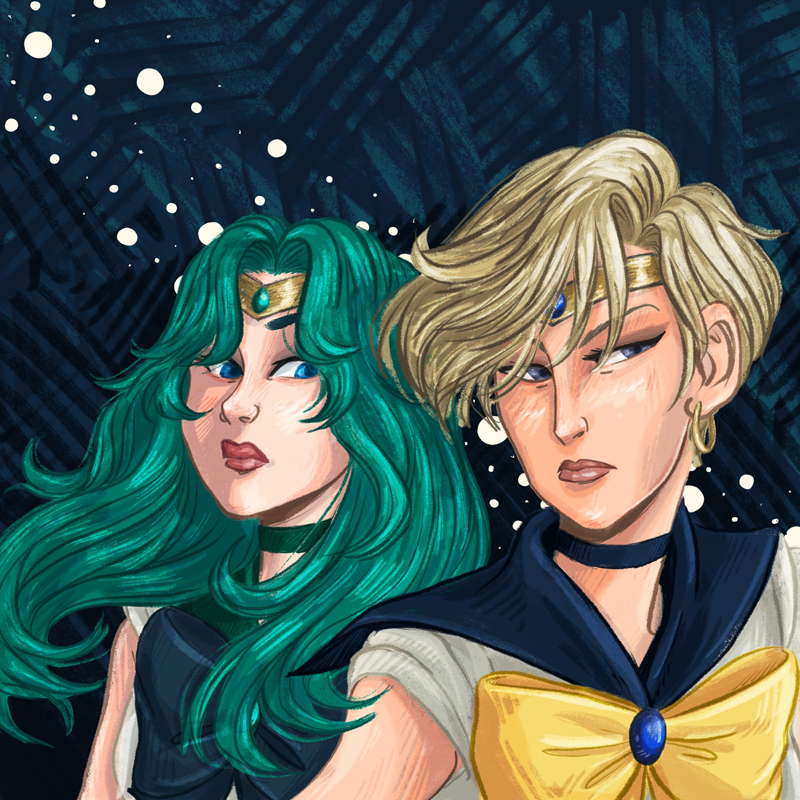 Each month we’ll feature a creator in the Sailor Moon community – an artist, cosplayer, graphics editor, youtuber, fanfic writer, anyone making things for other Moonies to enjoy. We’ll give you a little bio on that person, link you to everywhere you can find their work, and do a mini interview. We’re kicking this new corner off by highlighting Andrea Miller, the designer of our new logo! 1. How and when did you first discover Sailor Moon? The first time I remember seeing Sailor Moon was as a kid on a TV in the waiting area of a family restroom at my hometown mall. A friend in my girl scout troop showed me her Sailor Moon doll once, and I remember scarfing down pizza while watching a dubbed Sailor Moon movie on VHS with my friends in highschool, but beyond those brief encounters I really didn’t know much about it. It wasn’t until college when I started dating my wife (who had a long-term childhood obsession) that I finally sat down and gave the show my full attention. I was mostly drawn in by the character designs and the gorgeous music, but the further I went into all the various forms of the story, from the manga to the musicals, the more layers I found in the names and designs and attacks for every character. If there’s one thing I’m forever drawn to, it’s obscure references to mythology and science. Rather than growing up with the series, I grew into it. After this first true introduction to the show, I sat down and drew out a mini-comic that my wife had written called Peace is Boring! in which Neo-Queen Serenity, bored with the eternal peace ushered in by her reign, sets up a tournament fight between the inner and outer senshi for a questionable grand prize. Sometime after that, I spent more time re-watching the S season more closely after finding out that it was directed by Kunihiko Ikuhara and had strongly influenced the show Revolutionary Girl Utena. I had binge watched Utena and gone mad over the aesthetic choices, the dark and intriguing themes, and surrealist, disjointed storytelling, and I decided that a crossover was necessary, which lead to my Utena Moon series. 2. Who is your favorite SM character? That’s such a hard question to answer; Takeuchi-sensei has given us SO MANY amazing characters! In terms of character design, I’m really drawn to Saphir of the Black Moon Clan. Frankly, I think all the main antagonists are absolutely brilliant– I do love a good villain! Out of the senshi, though, Mako-chan forever has my heart. I really identify with her physical and emotional strength, and her struggle with being perceived as tough and sensitive at the same time. I don’t often see writers tackle that dichotomy in women characters, and I really love how it’s handled with her. 3. Which SM character(s) do you enjoy drawing the most? Anyone with good hair. ( So, like… the entire cast?) Haruka is really fun, but c h a l l e n g i n g. I feel like I only sometimes capture all of their non-binary brilliance. I really like drawing the characters with ponytails too, so Mako-chan and Fisheye are definitely high on the list! 4. If you were a magical girl what would your superpower be? I’m bad at confrontation, so something to do with healing might suit me best! I’m a bit of a cleric at heart, but I’m not as pure as Usagi. I’d be the type of healer that grumbled at you to quit dying all the time, but… the grumbles are a front to hide my constant worrying! 5. What are your favorite things/characters to draw outside of the SM universe? Aside from my own arsenal of original characters and comics that I’ve been drawing for over a decade, I’m thoroughly enjoying Yuri!!! on Ice right now. If you’re as enamored with the podium family and all the amazing characters in their orbit on and off the ice, then stop by my twitter! Definitely check out Andrea’s site and social media! And if you want to be featured or know someone who you’d love to see featured in a future Moonie of the Month corner, contact us!